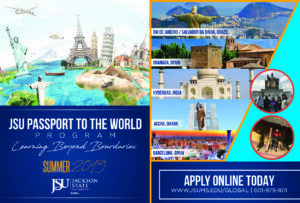 "JSU Passport to the World" (PTTW) is a short-term- faculty-led international experience that includes organized cultural, research, and experiential learning activity. PTTW is a six credit hour course that ranges from two to four weeks abroad . It is expected that the educational and cultural experiences will have an indelible impression upon the lives of students through increased cultural awareness, change in academic performance, and increased career opportunities. *Airfare not included in program fees.